Inspired by a YouTube video of another candy sorter, Willem Pennings decided to build his own version. 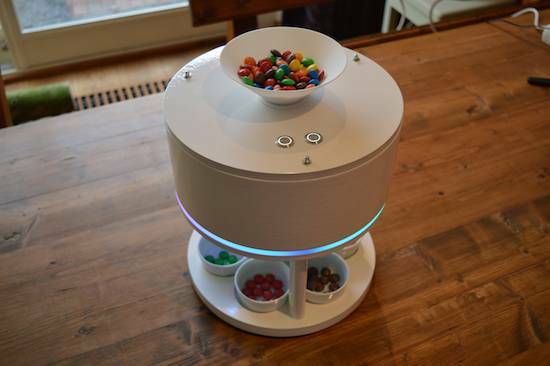 After nearly eight months of work, he now has a device that can separate M&Ms or Skittles into their respective color dishes. Control is accomplished via a pair of Arduino Nano boards along with two EasyDrivers and an RGB sensor. These actuate a small servo for mixing the candies, and a stepper motor to properly position the candy tube. Besides designing the controls for the machine, everything is modeled beautifully in the NX10 CAD package. 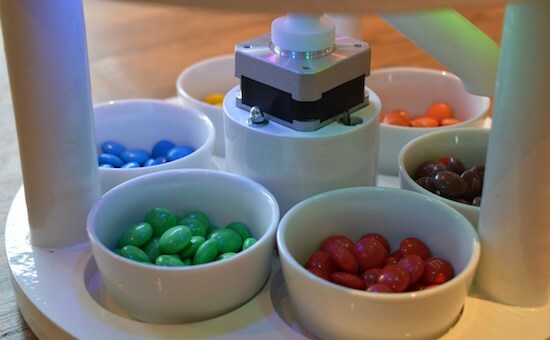 The results, as seen in the video, look extremely polished–and it’s quite soothing to watch these candies drop into their little bowls in automated fashion! You can find more details on Pennings’ project page and check out the video that inspired him here. I actually did see one Youtube video about sorting M&M candies by color! And it was amazing actually, especially for a beginner like me. I studied the concept and the modules needed here, and voila, I know how this thing works already. I am planning to “replicate” something like this – a good project for a beginner like me. Thanks for this article. This inspired me as well. Hi, I’m interested in your project. You could pass the code so I can do mine. Greetings.